When it comes to excess body fat, most people deem their bums, legs and tums to be the places they’d like to lose it from the most. 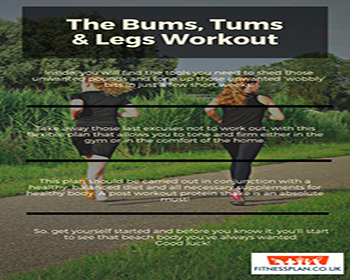 Our ‘Legs, Bums & Tums’ plan offers an enjoyable way to tone and firm up those offending areas, without having to spend endless hours on the treadmill. This plan is extremely popular with women who are determined to tone and shape their overall body shape. Our Legs, Bums & Tums plan is perfect for those wanting to shed body fat, as it is designed to burn just tons of calories in an extremely targeted way. It is also perfect for those who just want to get fit and improve their aerobic fitness and overall stamina. By purchasing our ‘Legs, Bums & Tums’ workout and following the six specific workouts three times each week, you’ll notice a transformation in the firmness of those areas in just a few short weeks.